This is our 5n1 wet dual lane combo! 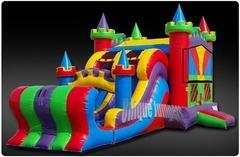 Have a blast in this units spacious bounce area, climb the dual ladders and slide down into a pool. This combo bounce house features a safety ramp, shade cover over the bounce area and a dual lane slide. This unit is suitable for kids from 2yo up to 13yo, sorry no Adults. Give us a call today or reserve online now, we look forward to serving you at your next party or event. 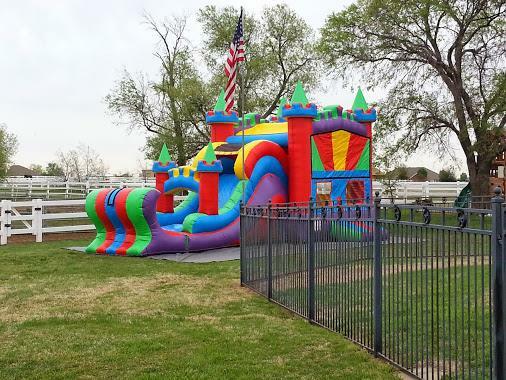 We have a big selection of bounce house rentals as well as water slide rentals. Be sure to see them all! Also add some flavor to the party by adding one of our concessions. 1- graden hose that will reach to where you want the Inflatable set up.